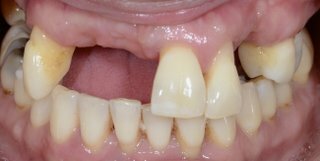 For patients missing several teeth, a removable partial denture may be recommended. This type of denture uses the remaining teeth to hold or anchor the removable bridge in place. There are many different types and designs for removable partial dentures. Typically, a removable partial denture is made of a metal framework with pink plastic to replace the gum tissue and plastic or resin denture teeth. The number of missing teeth and their location will affect the comfort and stability of the removable partial denture. The use of dental implants may increase the stability of a removable partial denture. Consult a prosthodontist to determine if a removable partial denture will satisfy your needs. 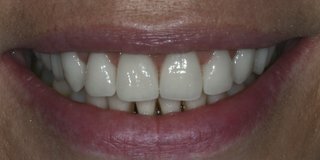 A prosthodontist can offer you many designs for your removable partial denture or provide other alternatives to consider including dental implant-supported crowns and bridges. Dentures are removable replacements for missing teeth. Complete dentures replace all teeth. By matching each individual’s unique smile and bite, dentures can improve facial appearance and self-confidence. Dentures can also solve pronunciation problems caused by missing teeth and improve chewing. Immediate dentures can be placed the same day as your teeth are extracted. These dentures allow you to wear teeth while your gums are healing so that you can confidently go out in public without being embarrassed. Typically, the immediate denture is replaced after your gums heal with either a conventional complete denture or an implant denture. Remember, getting a new set of dentures is like a new pair of shoes - you must break them in! You are looking for a more affordable tooth replacement that you can remove at nighttime for easier cleaning. It is important to have a consultation to see if you are a good candidate for dentures. We have an onsite laboratory so that our dentures are all custom made for each individual patient.